One of the few collectors worldwide who focuses on tribal rugs, city-based Danny Mehraa��s unusual hobby has been described as both a passion and a mania. Kynkyny Art will, this week, showcase around 75 carpets from his personal collection, curated from countries between the Black and Caspian seas, as well as from Turkey, Iraq, Iran and Syria. Throughout the three-day exhibition, Mehra will be present at the gallery, engaging visitors in a daily talk that will reveal the stories behind the weaves. The first carpets in Mehraa��s collection were a wedding gift. Turkish in origin, they came from a department store in the US, and had pride of place in his home for nearly a decade. It wasna��t until the early years of the new millennium that he began to seek out older, tribal pieces. a�?With the aid of the Internet, it became easy to look online, and identify interesting carpets,a�? explains Mehra. Since then, his collection has grown rapidly, through online auctions and sales. a�?Most tribal carpets have made their way from villages, where they were created by nomadic women, to a centre such as Istanbul, and from there to the West, where they are sold to collectors,a�? Mehra explains. Tribal rugs differ from post-industrial, so-called a�?citya�� and a�?palacea�� carpets in their size and composition. Typically woolen, their small size is a product of their creation on a loom that would fit into a tribal tent. Visually, they lack a template, instead reflecting the creativity of the weaver. a�?Every time you look at a tribal carpet youa��ll see something new,a�? explains Mehra. While most collectors focus on a region, Mehra hones in on a particular visual aesthetic. a�?People have told me that my collection is impure, but Ia��m interested in carpets that are quirky,a�? he says. a�?I like it when the weaver has broken the rules,a�? he adds. And the spontaneity of the collection is obvious. 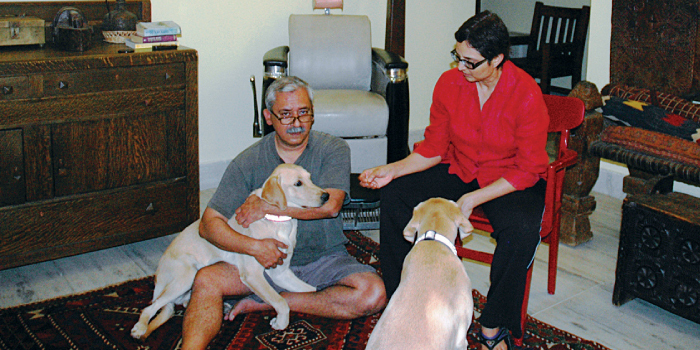 The carpets are stored behind a series of bookshelves in Mehraa��s large, open-plan living area, and as he unfurls one example after another, his labradors happily jump onto them. a�?The dogs are called Luri and Tulu, after particular tribal weaves,a�? he laughs. 10 am till 7 pm, until September 20. At Kynkyny Art, Infantry Road.